Đắk Lắk — Lắk Lake in the Central Highlands province of Đắk Lắk is where travellers can take a glimpse into the unique cultural life of local ethnic communities, find appetising specialties and experience the fantastic gong culture, which has been recognised as a world cultural heritage by UNESCO. Situated some 50km from Buôn Ma Thuột City, Lắk Lake also boasts its own charms. In the local M’Nông people’s language, Lak means water. 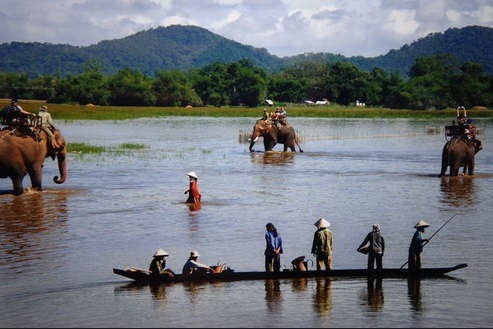 Legend has it that Lak Lake was born by Lak Lieng, a hero of the M’Nông ethnic people. The 650ha lake is close to the Krong Ana River, which flows from the 2,500m high Chu Yang Sin Mountains, and is surrounded by the river on one side and by mountain ranges on the other three. To the Lắk Lake, visitors can experience the tranquil atmosphere of the mountains of the Central Highlands. In the morning the lake looks like a picturesque painting with lotuses in full bloom, wooden boats and elephants carrying tourists around it. Jun, M’Lieng and Le villages around the lake are home to the M’Nông ethnic group, which has preserves its exotic cultural traits and introduced them to tourists from far and wide.